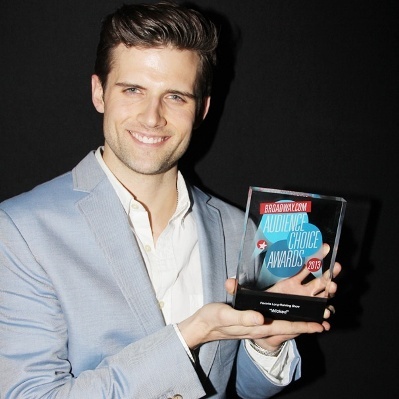 After starring in Wicked on and off for seven years, Kyle Dean Massey is more than qualified to accept the hit musical’s Broadway.com Audience Choice Award for Favorite Long-Running Show! Massey took the stage as the representative for Wicked at the awards ceremony on May 5, and he was visibly moved to accept the 2013 BACA for the whole team. Wicked is no stranger to the Broadway.com Audience Choice Awards—the smash hit also took home the 2013 trophy for Favorite Tour. In previous years, Wicked also snagged trophies for Favorite Tour in 2011 and 2012, as well as Favorite Long-Running Show from 2005 to 2012, and Favorite New Broadway Musical in 2004. This entry was posted on Tuesday, May 7th, 2013 at 7:25 pm	and is filed under Uncategorized. You can follow any responses to this entry through the RSS 2.0 feed. You can leave a response, or trackback from your own site.